Evaluation: Versatile combo forward that plays with great effort both inside and outside. A talented wing that can take defenders off the dribble in a point forward role or go inside and score around the rim. Has a nice shooting touch with three point range and a consistent release. 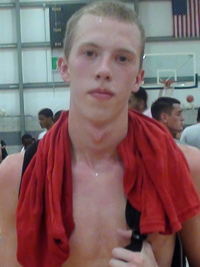 Good athlete that uses his length to make energy plays on the boards, blocking shots, and offensively in transition. Bottom Line: Bradds should be a good fit at the mid-major level where he has the capability to play an uptempo style or execture in the half-court as either a wing or a stretch PF role. Has rapidly improved and with a little more strength could reach high-major status. Notes: Committed to Belmont in June after his junior season. Prior to that Bradds had been committed to Ohio University but de-committed after a coaching change.